Trina Solar (TSL) is a China based vertically integrated company right from the production of ingots to modules. The company was founded in 1997, with 12 offices worldwide. Trina Solar has partnerships with leading installers, distributors, utilities and developers in all major PV markets and is listed on the NYSE. Trina Solar is one of the lowest cost Chinese solar panel manufacturers globally. 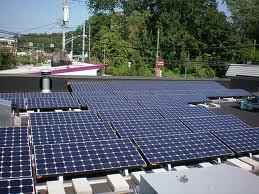 SunPower Solar panels are used for residential purposes primarily. They are classified into: i) SunPower X Series – X21-335 and X21-345, ii) SunPower E Series – SPR 327, iii) SunPower Signature Black Solar Panels and iv) SunPower AC Solar Panels – E 19/240. All SunPower Solar panels come in a monocrystalline make. Trina Solar modules are classified for convenience into: Business Need – Commercial, Residential & Utility. Trina Solar offers i) PA05: 60 cell Universal (residential, commercial and utility) ii) PD05: 60 cell Dual Glass (residential, commercial and utility) iii) PA14: 72 cell Utility, iv) PD14: 72 cell Utility. SunPower Solar panels come in a monocrystalline make with 72 and 96 cell arrangements. While for Trina Solar the cell type is 125×125 mm in monocrystalline modules and 156×156 mm in multicrystalline modules. The available wattage for SunPower Solar modules are 240 W, 320 W, 327 W, 335 W and 345 W. The solar modules’ wattage for Trina Solar range between 240 W – 305 W.
SunPower has ~0-+5% power tolerance, while Trina Solar modules have a power output ~0-+3%. Trina Solar modules weigh 15.6 kg for monocrystalline panels and 19.5 kg and 28 kg for multicrystalline modules and SunPower modules weight range is between 17 kg to 18 kg. Trina Solar come with a 10 years product warranty & 25 years linear power warranty. SunPower solar modules come with 25 years limited power and product warranty. Trina Solar Modules are manufactured according to international Quality and environment Management System Standards ISO9001, ISO14001. SunPower ACPV module are listed to UL 1741. You can read more technical details about the solar modules here: SunPower and Trina Solar.